twitter Geo-location. Where is my child? You can determine the place where the child or any other person is by use of the RealVisor gadget. There are 2 variants of this function. Enough to send SMS with text "G" or "GPS" on the telephone number that has a SIM-card in the RealVisor gadget. Conversely you will receive EMAIL, and (or) SMS with information indicating where the RealVisor gadget currently is. You must select in the program: Settings - Alerts - EMAIL, SMS. In order to test how well come a message to EMAIL and SMS, you need to choose in the program: Settings -> Geo-Location -> Test. You need to have 2 android gadgets. One gadget is the main one in which the program operates in the hidden mode. The second gadget is the client one in which the program operates in the client mission. We want to know the position of the main gadget on the geomap. Note, both gadgets enable IP-telephony mode and have their gadget SIP-address. 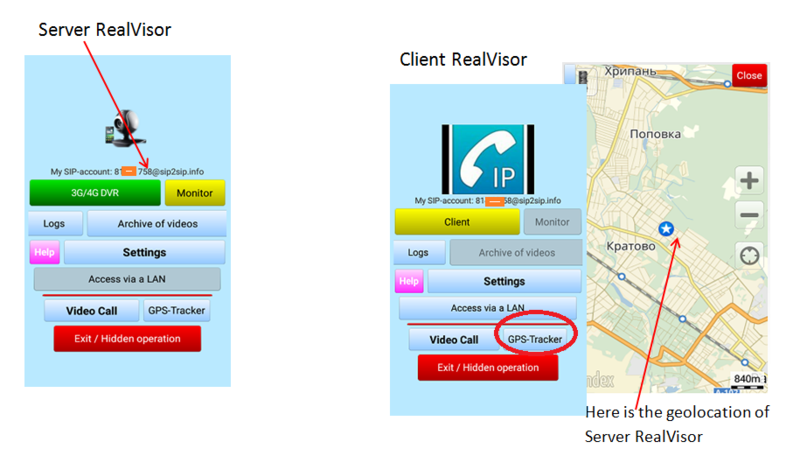 On the client gadget, select the GPS-Tracker function. Then specify the SIP-address of the working (main) gadget by clicking on the + button. Click button "Geo location". After a few seconds, the special marker will indicate the current position of the working Gadget on the map. How do I find the SIP-address? The sip-address can be found on the main page of the app as a special string, for example, "My sip-account=72484418@sip2sip.info". Important! Make sure that the gadget is turned off Wi-Fi and mobile internet is turned on.